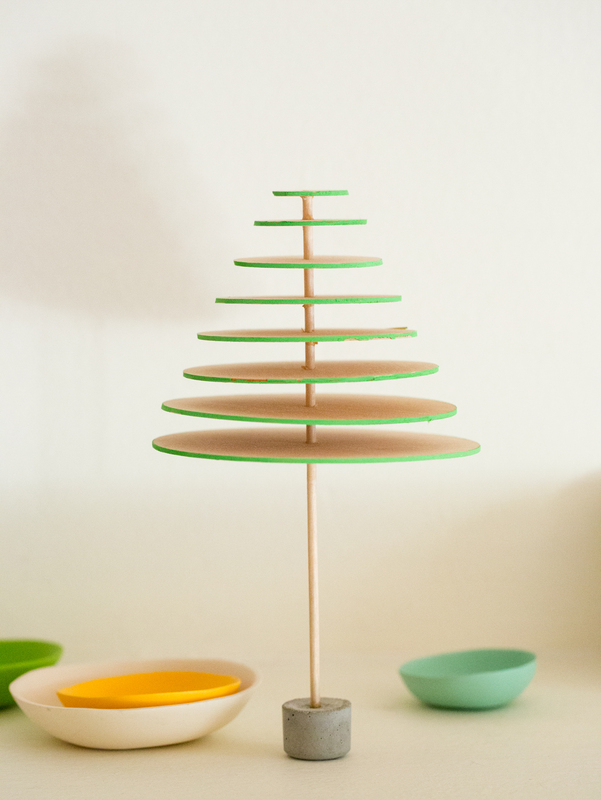 I’ve had this idea for a little modern Christmas tree in my head for a long time now. I really love those little bottle brush Christmas trees because they are the perfect Christmas décor without being overly Christmas, and this is my modern take on those cute little trees. This is what I will be displaying on my mantle as a set of three this year. This may seem a little overwhelming, but it’s actually very simple and easy to put together. The most annoying part being using a drill, which isn’t really that annoying. 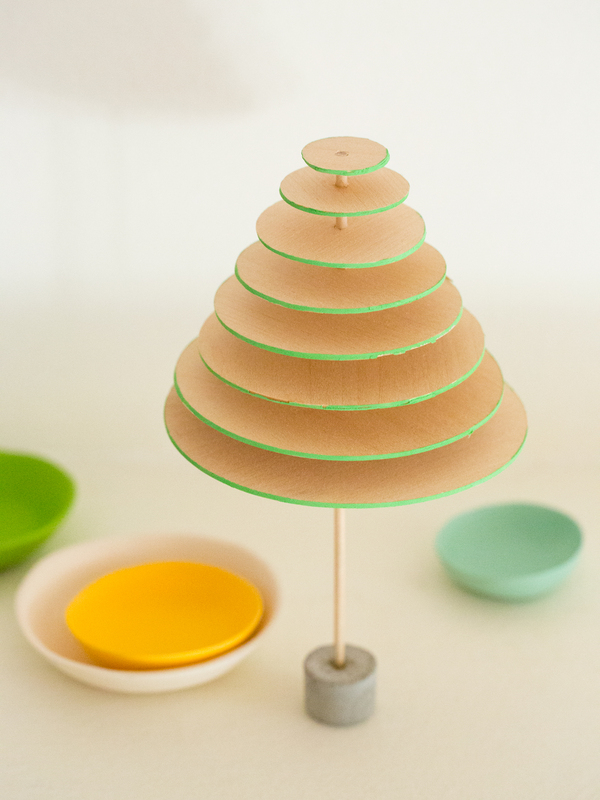 – Balsa wood sheets. You can get these at most art stores, or Orchard Supply has them as well. You can also get them on Amazon. – Circle cutter. I tried maybe 4 or 5 circle cutters for this project, and this one I think is the best. – Quick dry cement, I used this one. – Little plastic cups for bottom. I really like these, and they are cheap and have a nice simple shape. – Tape. 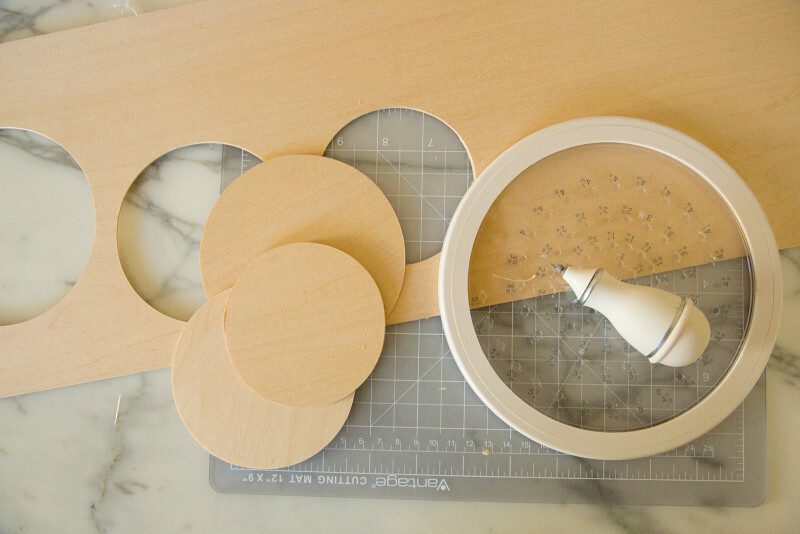 Washi, scotch, whatever is ok.
– A tool to cut the wood dowel, I used this handy miter box. 1. Cut a small piece of the dowel off about 3 inches. Mix a small amount of cement, enough to fill the little container you have chosen. 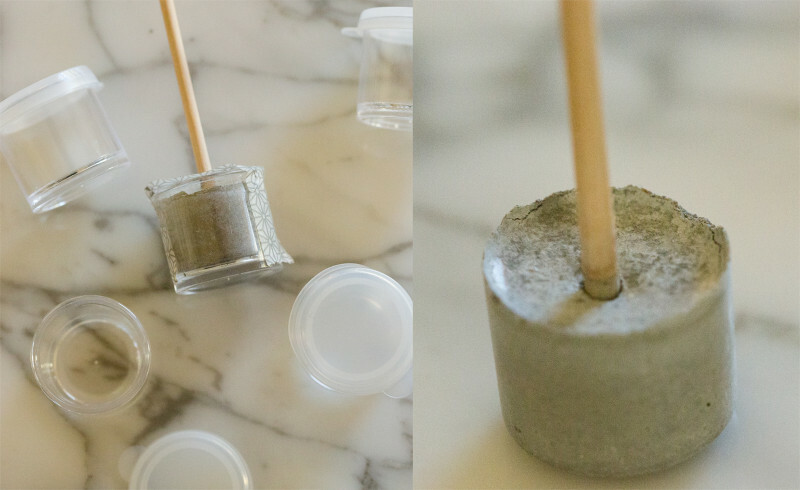 Pour cement mixture into the mold and then place the little piece of the wood dowel into the mixture and secure straight with a piece of tape. Let dry according to the manufactures directions. *( It was very easy for me to retrieve the cement out of the plastic mold I choose, if you feel like this might be an issue for you, you can spray the inside of your mold with some cooking spray). 2. Cut the balsa wood sheets using the wood cutter. I cut mine in half in increments starting at 4.5 inches and ending with 1 inch. That gives you 8 rounds. 3. Once you have the rounds make a mark to designate the middle of the rounds. 4. Using your drill and the drill bit you have chosen that matches the diameter of the dowel you’re going to use, drill holes in the middle of the wood rounds. Make sure to do this very safely. 5. 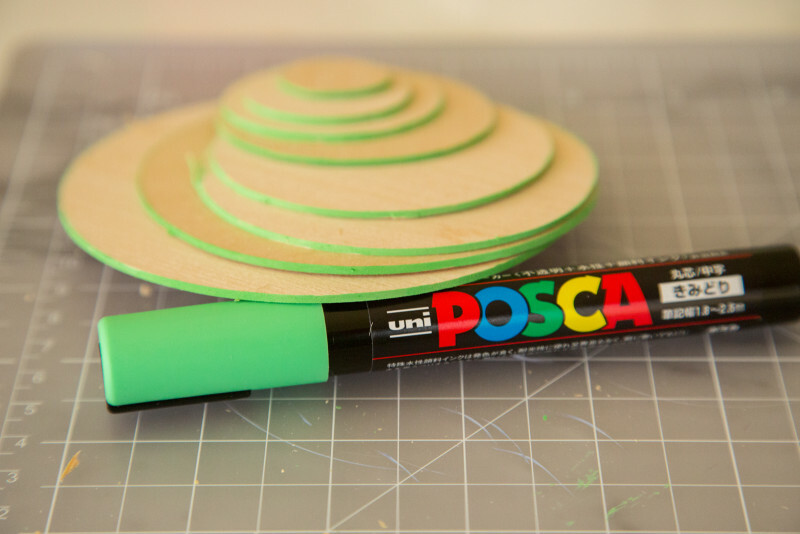 Use the paint pen to color the edges of the wood rounds. 6. Measure the dowel to allow a half of an inch in between each wood round and allowing about 4 inches for the trunk. 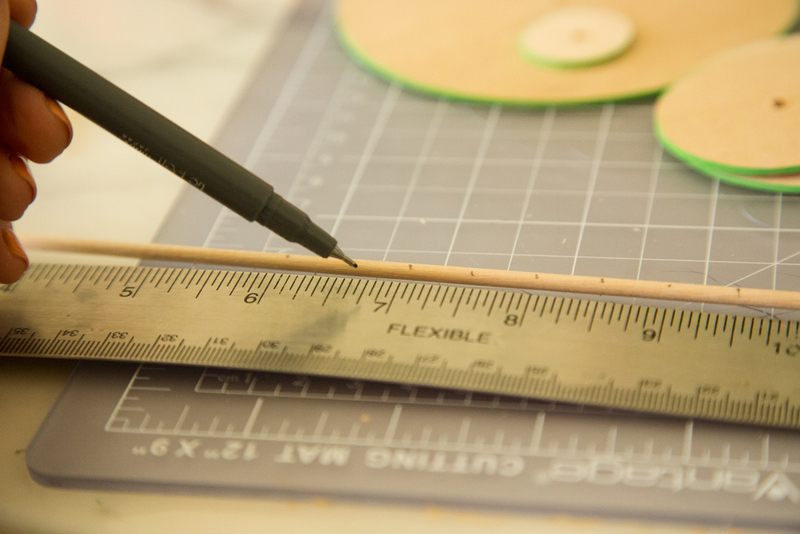 Use a writing utensil to mark these measurements on the dowel. 7. Slide on the smallest wood round into its place. Dab a small amount of the glue on the bottom where the wood round meets the dowel and spin the dowel to smear the glue all the way around. Wipe off any excess. Repeat this step with the rest of the wood rounds. Let dry according to the directions on the glue you used. 8. Once your cement is dry gently lift out the dried cement using the dowel. Twist the dowel to remove it. 9. Using your fine sand paper, sand off the rough edges of your cement piece. 10. Using the regular gorilla glue, squeeze some into the hole of the cement mold and place the tree into it. Wipe off any excess that might appear and let dry. 11. Done! 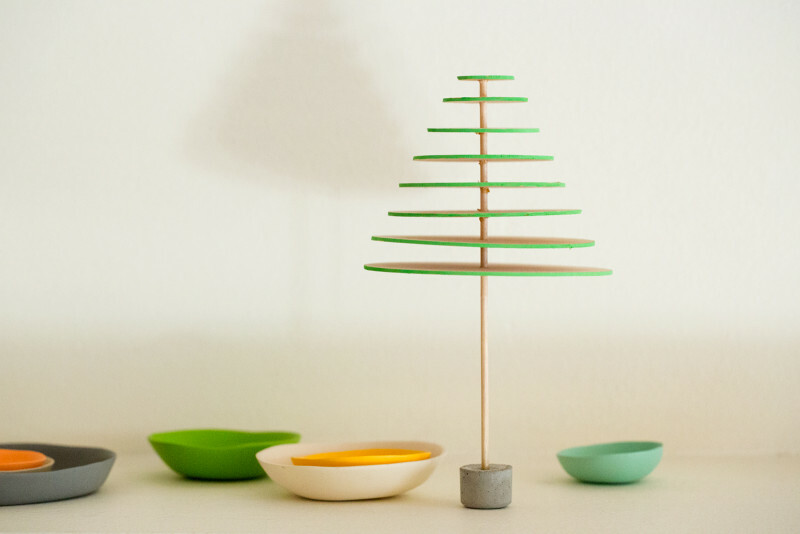 Enjoy your super cute modern mini tree! What a cute idea that you came up with I am anxious to try.